Disney+ keeps getting bigger and it hasn't even debuted yet. 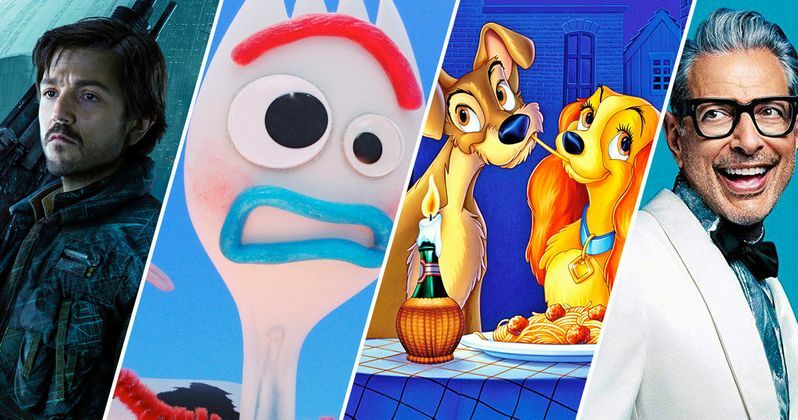 Today is Investor Day 2019 for Disney shareholders and we've received an avalanche of new titles coming to the streaming platform, including the live-action Lady and the Tramp, a Toy Story Forky Spin-Off, and a Jeff Goldblum show, to name a few. The Toy Story Forky spin-off will be a short is titled Forky Ask a Question. The studio is also releasing another short featuring Bo Peep from the massively popular franchise, entitled Lamp Life. If that wasn't enough, Disney+ will also have a Frozen 2 behind-the-scenes documentary. However, the big feature of the Disney+ streaming platform is Disney's "Signature Collection," which features all of their old classic movies and new titles, like the live-action Lady and the Tramp movie, which features the voices of Tessa Thompson and Justin Theroux. Disney also provided the first look at the movie in the form of a still image and it features real dogs. Don't expect some CGI backlash like The Lion King remake is currently getting. Instead, Disney is bringing it back to the times of Milo and Otis, which should satisfy some fans as long as the animals were given nice trailers and frequent breaks. With the Fox acquisition, Disney was able to get their hands on The Simpsons, which will be streaming on Disney+ . The streaming platform now boasts itself as "the exclusive streaming-video-on-demand home of The Simpsons," and it will have all 30 seasons of the iconic show to stream on the premiere date. Disney is flexing pretty hard right now with all of these announcements and it's going to be crazy when they finally release their streaming service later this year.